We have a solution for those pet stains in hardwood floors. Yes, that’s correct! Now, we can provide a cheaper solution for our clients. Replacing those damaged boards has been the only solution for over 100 years. That can get pretty pricey, especially if you have a hundred damaged boards. Dog urine contains many contents such as uric acid, sodium, potassium, chloride, magnesium, calcium and ammonia. 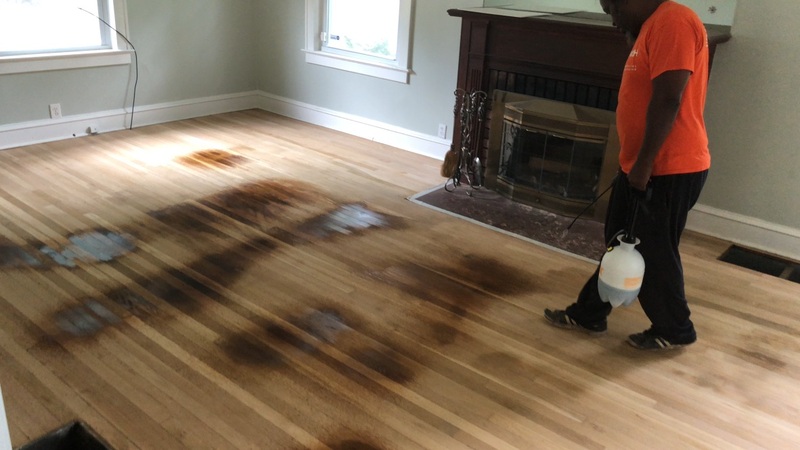 This treatment will extract all of those chemicals out of the hardwood flooring. It can prolong your project by a few days, but totally worth it in the long run. Also, keep in mind – this treatment will reek the house of ammonia. That is because those chemicals are being pulled out of the hardwoods. Each spot will need to be treated at least 3 times. 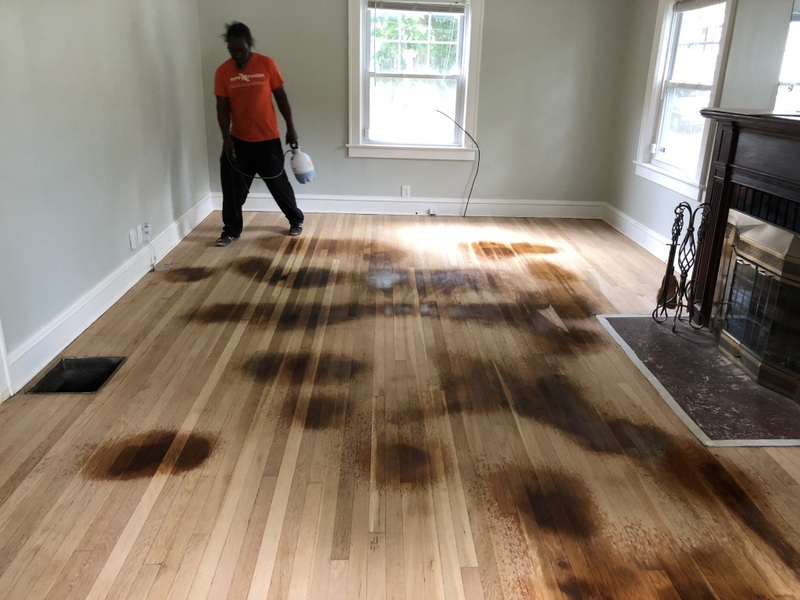 And, between each treatment – the entire floor will be sanded. 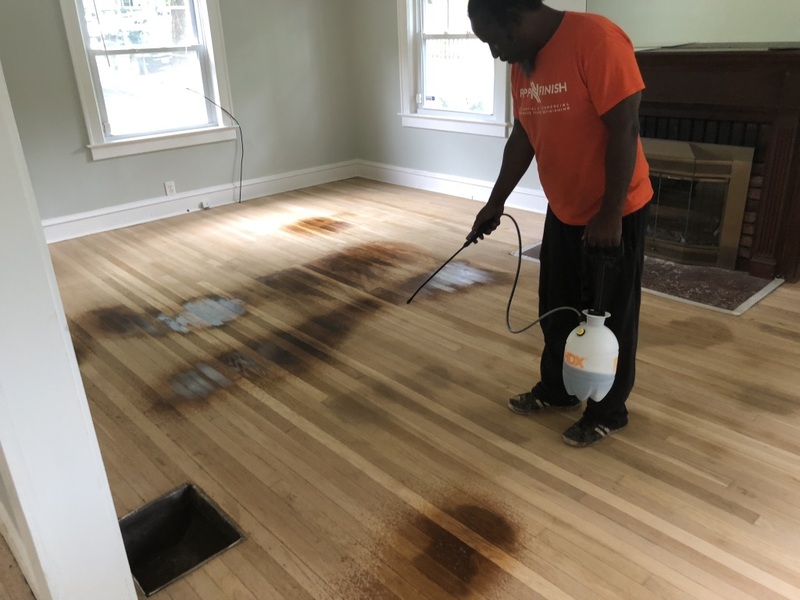 This allows the treatment to penetrate deeper and deeper into the hardwoods, between every round of sanding. In some cases, if the stains are bad enough, we may even let the treatment sit overnight. It’s best to do this during the summer because the home will need proper ventilation. Typically, by the third pass of sanding you will start to see the pet spots turn white. And the pet spots will be much smaller in size. 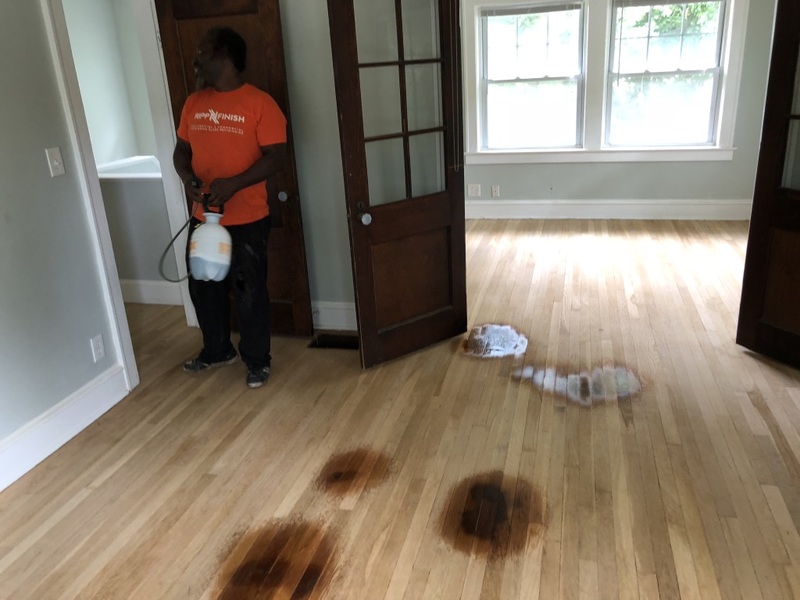 It’s important to test the pet spots with stain samples and the poly, before doing the entire floor. In some cases, these pet spots may retract a water based poly. We alway recommend an oil based sealer and oil based poly for this type of project. If there is any ammonia left over from the treatment, then the oil based products will seal that in much better than water based products. 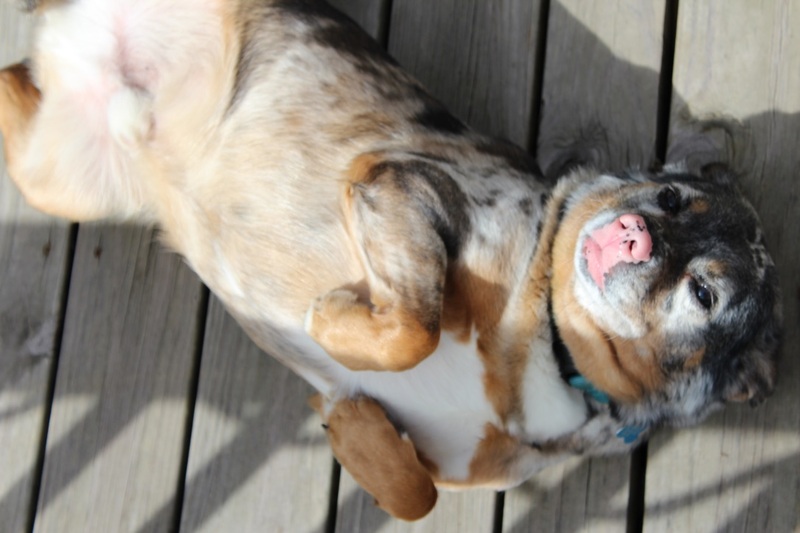 Before spot treatment was discovered, we had a project in the past that had a few pet stains. The customer did not want to replace the boards but just stain the floor dark to help camouflage the pet damages. Sure, no big deal – right? Wrong! We stained the floor espresso, applied water based sealer, and top coated with water based poly. The floor looked absolutely beautiful, other than the pet damaged areas. The ammonia was eating through the stain color, sealer, and two coats of finish. Crazy! 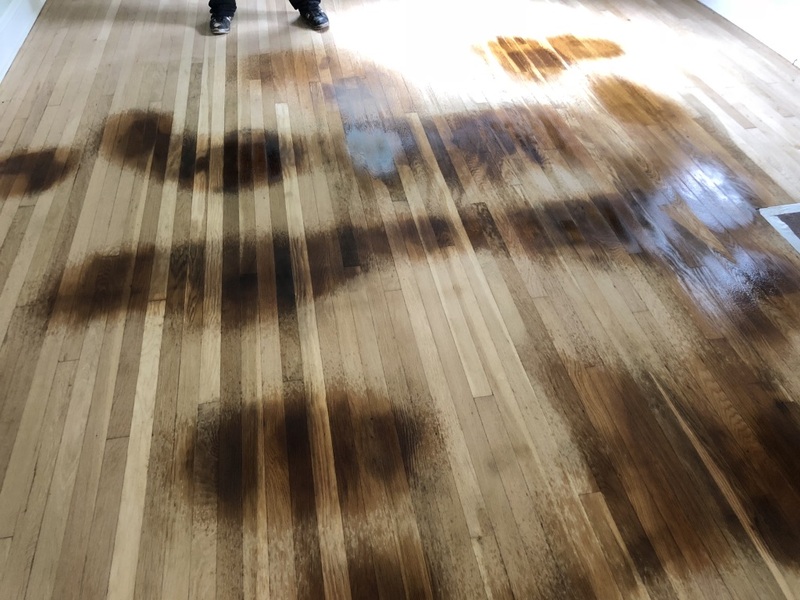 So, we sanding those urine spots, put an oil based sealer over it, then brushed water based finish over that to blend with the rest of the flooring. It was only a quick fix. Those spots ended up eating away the protective coating again. The solution here – replace those boards or spot treat. We’ve learned from trial and error with these pet stains and they do not go without notice. Take them serious and get them out of your way before apply varnishes. It’s important to sample the stain colors over these treating areas. For the simple fact of seeing what color will blend best over the urine spots. Now, in many cases those pet spots will come completely out. Therefore, you can choose a range of colors, including light colors. In other cases, the pet spots may have just got smaller or faded but still show their presence. If that’s the case, going with a light color is completely out of the question. Sampling dark browns will be the best outcome. With pet damages – replace the boards or try spot treating. Do not use water based products for projects that involve pet damages. You’re asking for trouble! Go with oil based or formaldehyde based products. Expect to have a few extra days for treatment. Properly ventilate the house during treatment and coating. Here are a few brands that we recommend using for projects with pet damages. Let us come take a look at your project!